Clean up, Santa is watching! Getting ready for next year's spring growing season is already in motion. Small things may seem small, but always lead to time consuming pain-in-the-arse moments. One may think to one's self, "Ah, a rake and one hour shall do." No, not quite. One thing led to another, and before I knew it, I was unintentionally making my life more difficult than it needed to be. For myself and my family, organic gardening means using everything we have at our disposal to provide nutritious and healthy soil for the plants to thrive on throughout the growing season. There is no right or wrong way, it is about doing the best you can with what you have, what you can afford, and what you learn. I find that I'm more creative when there are restrictions on what I can use and have discovered ideas for how to prepare and create food for my plants on a budget. My plan for this year is to start using the chicken manure compost that my chickens and I have been working on since last year. which you can see below. I did the scooping, they did the pooping! 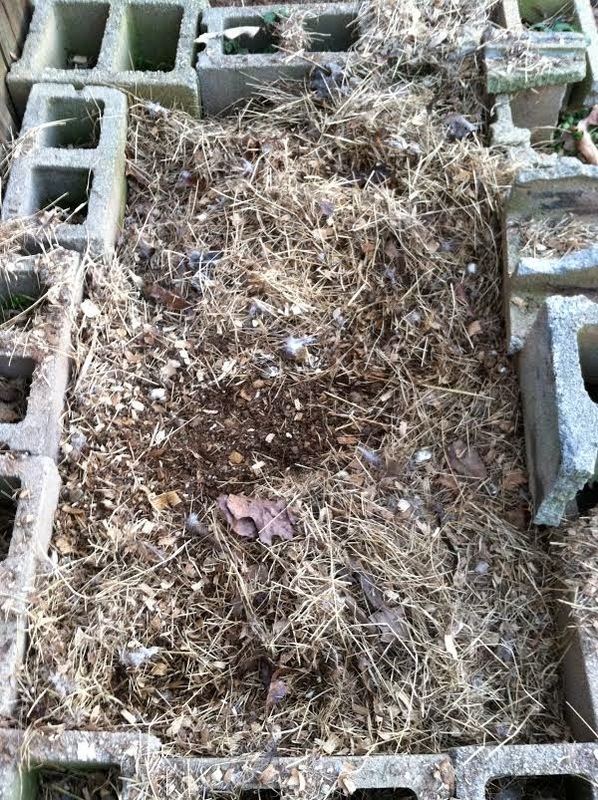 The picture above is chicken manure with pine shavings, as I often use shavings to keep their coop dry. Pine shavings take a long time to decompose, so I started a second pile for just chicken poop and other compost material. The raked leaves will be another form of compost to add to the garden when the time comes. 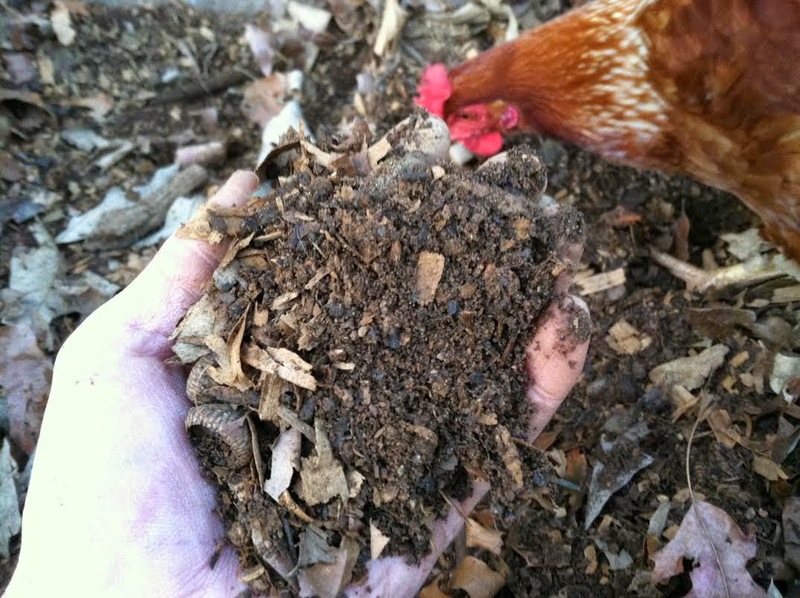 Compost provides balance to the pH of the soil and helps keep plants disease resistant. Last year I relied heavily on bagged compost from Home Depot and this year I hope to depend less on outside sources to fuel my garden. 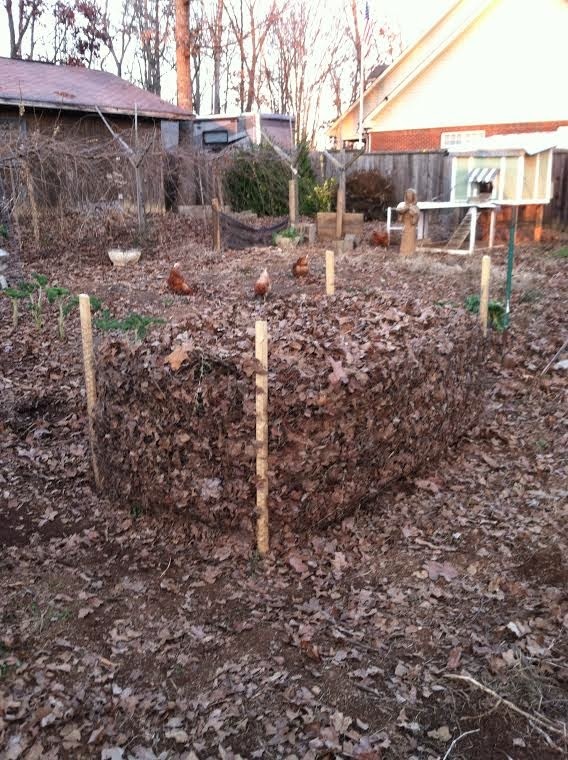 It is easy-peezy to make a leaf compost pile: stake four wooden posts in the ground and attach chicken wire around the outside to hold it together. Now for some color to this winter garden post! 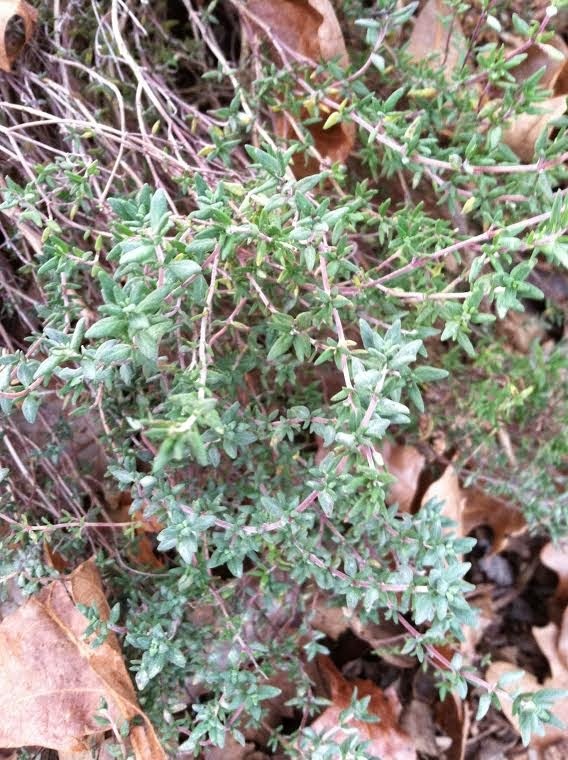 Thyme still looks beautiful - smells great! I read somewhere that you can bring bell pepper plants inside for the winter and replant them the following year. So I figured, there is nothing to lose given the cold would surely kill them. 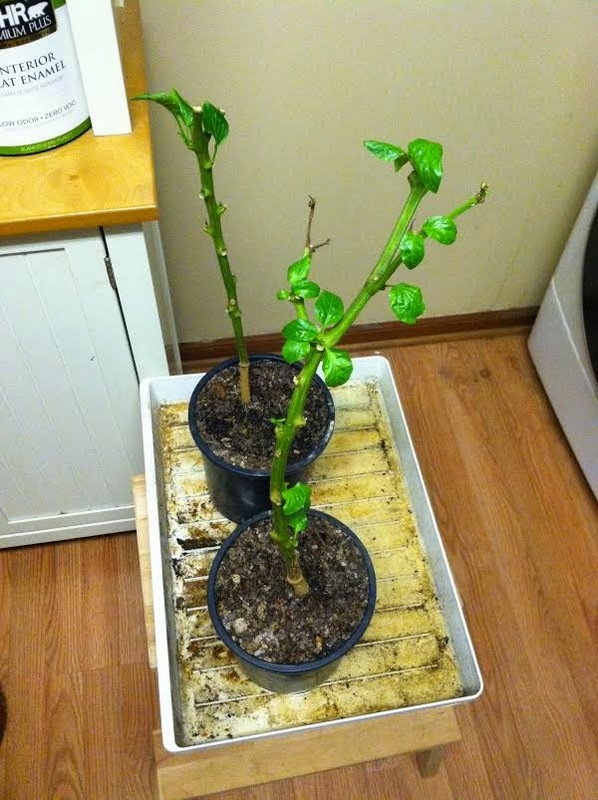 After two nights below freezing, I dug up the bell pepper plants and brought them inside. They lost all of their leaves and the upper stems turned brown and black. I thought, surely they won't survive. After trimming them and giving them some organic fertizlizer, I waited...and waited. "They are alive" <in my Frankenstein voice> "Muhaha." Hot damn, it worked! Plants are a metaphor for people facing challenges in life, as they show resilience and can survive and grow through life altering changes. I'm excited beyond measure given that my first planting of bell pepper seeds were a flop, and my second planting was so late in the season that I only got 5 bell peppers total between the two plants. As Robert Byrne said, "Up yours" I say to the freezing cold. So next year I plan on eating yummy bell peppers all season long. Last but not least is my other prize from the growing season. The only other plant I found difficult to grow and keep alive was rosemary for some reason or another. This pretty plant is a perennial, so it should stay strong as long as it is fed compost and fertilizer on a regular basis. All that is left to do is set up the beds for spring. I'm still thinking about whether or not to use rocks as a border or wooden boards, but I'll know in good time. 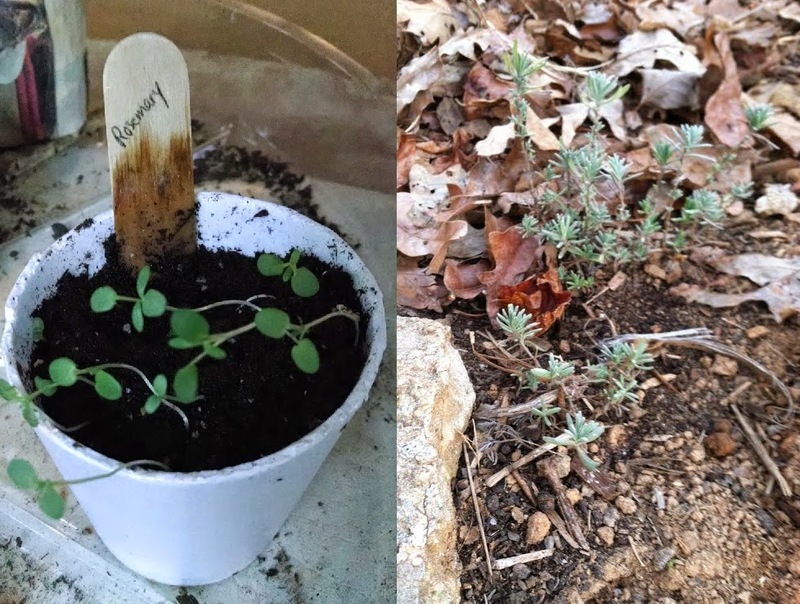 Rosemary seedling to small plant - Success!